Cooking dinner doesn’t have to take a lot of time. 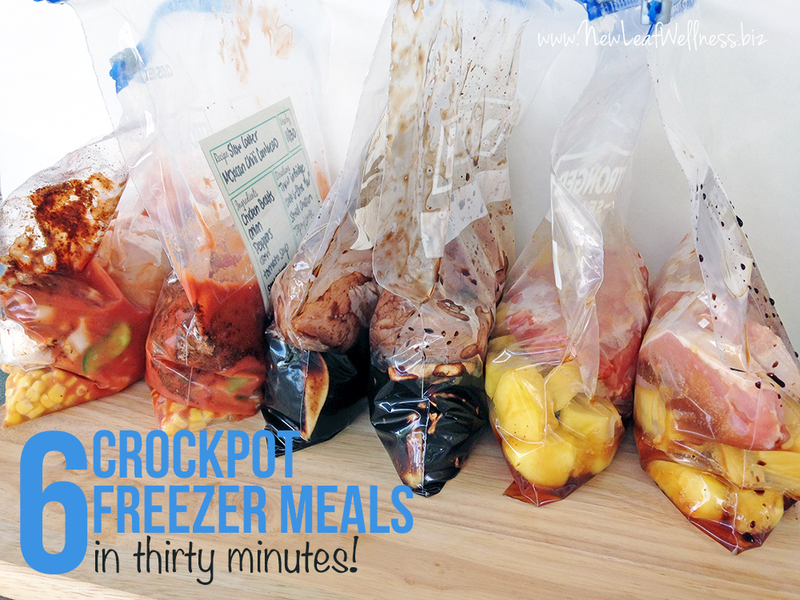 One of my favorite shortcuts is prepping simple freezer meals for my crockpot. Here are the recipes, grocery list, and info you need to make six meals in 30 minutes or less. Added 2/4/16: Once A Month Meals updated their balsamic chicken with pears and mushrooms recipe to include less vinegar. For the best result, use the recipe on their site instead of the one in the printable recipes. 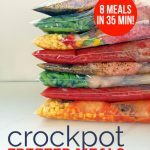 When I’m deciding which freezer crockpot meals to make, I look for recipes that can be frozen without any cooking ahead of time. Since all of these meals were frozen raw, they were super quick to prep and won’t taste like leftovers at all. A win-win! I also like to prepare meals that include at least one vegetable. This saves me time the day of cooking because I won’t need to prepare a vegetable as a side dish. Plus, it helps my family to eat healthy. You’ll save prep time because the same ingredients are used at least twice with the same measurements. 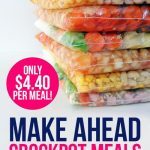 Freezer crockpot meals stay fresh in a standard freezer for at least three months and we always look forward to eating the same meal again after trying it the first time. Print the recipes so they’re right in front of you and you don’t have to look them up on your phone/computer/tablet. Set a timer in your kitchen for 30 minutes so you’re aware of the time and work quickly. 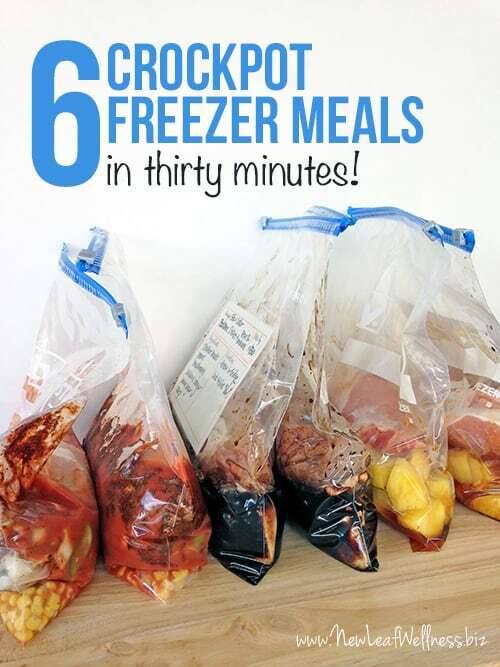 Then, when you’re ready to cook, thaw overnight in the refrigerator. 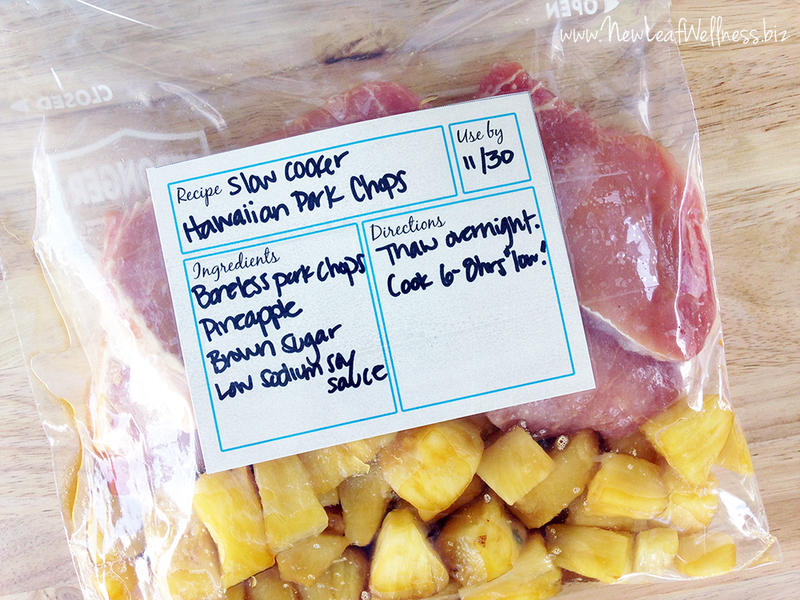 Add to your slow cooker and follow the recipe’s instructions. Enjoy! Questions? Leave a comment below and I’ll be sure to get back to you as soon as I can! 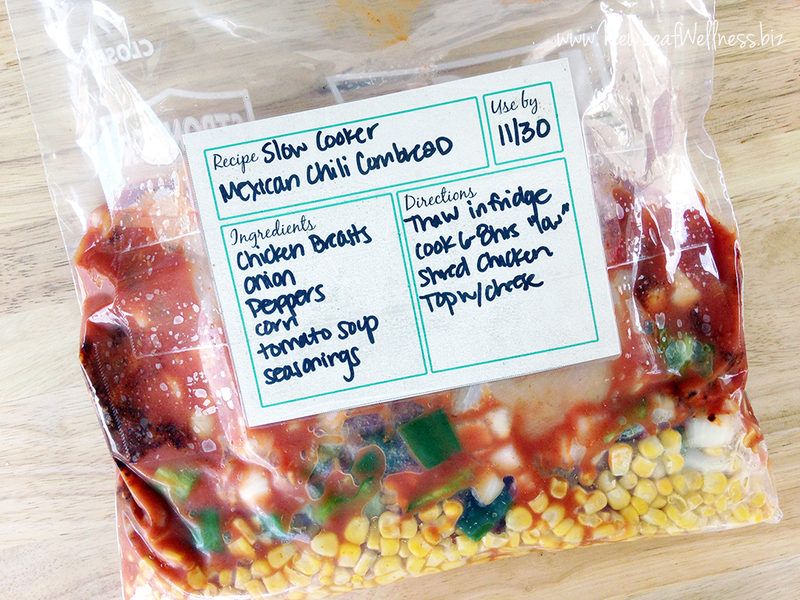 I’m new to freezer meals — can you reuse your ziplock bags? I would think that you could, but there could be a reason not to . . . Yes, you can wash and reuse them! I also freeze food that doesn’t have sauce in neat-os reusable food storage bags. Hi, I am trying to print off the printable PDF and it prints but skips much of the info. It isn’t my printer, I double checked that. I even tried to cut and paste and that comes out goofy. Do you have any suggestions? I am new to this and am really excited to try these. Did you try saving the pdf to your computer first? Thanks for sharing! I think it would be ok to wash and reuse bags, but I haven’t looked into it yet. One thing I do when I wash them is turn them inside out. That way you can get the corners good and clean. What a delicious recipe roundup! Thanks for including our Balsamic Chicken w/ Pears! Love it! So different than the other recipes I’ve tried. Your recipes are the best!! The recipe for the chicken looks great! Is it okay to use fresh mushrooms and pears? Some things get a little wonky in the freezer; I didn’t know if you’ve tried it with fresh stuff. Thanks! Yes, I used fresh! The pdf with grocery list and recipes explains what I did differently than Once a Month Meals. Where do u get the labels? what type of paper do you use to print the labels? And how do you place them on the bag? I’m asking because it looks like the ink would smudge and the paper tear or ripe if I used regular paper . I like to use cardstock and attach with clear shipping tape. Regular paper works just fine too, I just think the cardstock looks prettier. If you own it already, or are planning to buy it, no need to purchase the labels separately!! CAn you buy a big bag of frozen chicken breasts. Or would that mess it up ? Yes, you can absolutely use frozen. I’m not a big fan of store-bought frozen meat, but if you’re used to eating it go for it! Add it right to the bag frozen (don’t thaw it ahead of time). Won’t mess up anything at all! 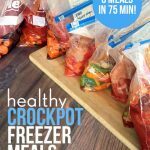 Hi – are there any meatless freezer crockpot recipes that can be shared? Thanks so much! Hi Mary! I don’t have a lot because we eat meat with dinner almost every night. There is a recipe for garden vegetable soup in my Easy & Healthy Slow Cooker Cookbook. I’m planning to share it for free in my freezer cooking session next week, so your timing is perfect. I also have a vegetable barley soup in my 15-Minute Freezer Recipes Cookbook, but that recipe isn’t online anywhere else. I will absolutely keep vegetarian meals in mind for future recipes. Thank you for your input! My daughter is vegetarian and I have a small crockpot just for her. I made two half batches of each recipe and substituted her vegetarian substitutes. When it calls for chicken or pork I used the Quorn Naked Breasts, used the Morningstar Ground for hambuger, and Smart Life Beefless Tips for steak. I’ve used these products in her crockpot before and they’ve been fine. I really like when she’s eating the same meals as everyone else.